Here’s the scenario: You woke up hours before the sun crawled out of bed to light the world, showered, got dressed, ran down to the bus stop and grabbed the bus to make sure you were in Disney’s Animal Kingdom for Extra Magic Hours rope drop. The crowds were thick, but with adrenaline pumping you grabbed one of the first Fastpasses for Exepedition Everest, ran through the line, and then bolted for Kilimanjaro Safaris. You were more awake than the animals, and then it happens. The adrenaline runs out and you’re getting sluggish. You realize that you didn’t have breakfast and you are hours away from lunchtime, what do you do? Then you see it, an oasis. Well, not the Oasis, near the park’s entrance, but a beautiful sight nonetheless. You’ve stumbled upon Pizzafari in Discovery Island, and they serve breakfast! During the morning rush this gorgeous restaurant can be pretty deserted, so be sure to take some time and explore each room and uncover their themes. As for the menu, it offers something for every appetite, from yogurt or fruit cups to breakfast pizza and platters. As for me, I wanted something quick and hot, that didn’t involve eggs (I have a think about eggs, but that’s another story). Then I saw it, Biscuits with Sausage Gravy. Now, I am the first to admit this is not a dish for everyone. 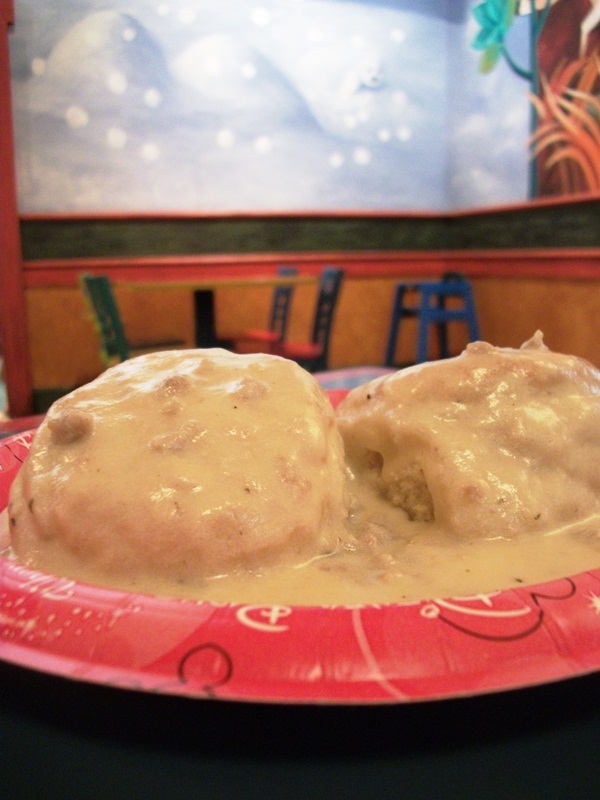 However, if you are a fan of biscuits and gravy then this breakfast will satisfy. For a reasonable price, under $4.00, I received two biscuits topped with a heaping serving of gravy. The biscuits themselves were very hearty, but maintain the flaky layers associated with a well-made biscuit. They were certainly substantial enough to stick with me throughout the morning. Sausage gravy can be very tricky. I have had my share of gravy that sat on my plate as a bland, white, starchy substance I didn’t really care to consume. I was pleasantly surprised that Pizzafari’s sausage gravy was far from this type of gravy. While I wouldn’t go as far as to say it was as good as a homemade gravy, it did have pieces of sausage present and enough of a kick to give it some real flavor. The next time you rush from your resort for a morning safari without breakfast, just remember Disney’s Animal Kingdom has you covered. And the Pizzafari oasis is no mirage! I ate breakfast here Christmas Eve 2009 with my youngest sister. I had the sausage biscuits and they were quite good, and she had the breakfast platter. With a large soda, we were quite full for around $12. It's one of those hidden gems!